Home / BELLEZA / CUIDADO DE LA PIEL / MAQUILLAJE / MAQUILLAJE DE NOCHE / MASCARILLAS / TIPS / AFINA TU ROSTRO SIN CIRUGÍAS!!! AFINA TU ROSTRO SIN CIRUGÍAS!!! TODAS QUEREMOS LUCIR UN ROSTRO HERMOSO, AFINADO. RESALTAR LO MEJOR QUE TENEMOS EN NUESTRA CARA, Y SABES ALGO? LO PUEDES LOGRAR SÓLO CON TRUCOS DE MAQUILLAJE, COLOCANDO LOS CORRECTORES EN LOS LUGARES ADECUADOS, Y SIGUIENDO EL PATRÓN DE LA SIGUIENTE IMAGEN OBTENDRÁS UN EXCELENTE RESULTADO. PARA RESALTAR LOS PÓMULOS, COLOCAREMOS UNA LINEA, JUSTO DEBAJO DE LOS MISMOS. Y AL FINAL , COLOCAREMOS CORRECTOR CAFÉ EN LA PARTE DE EL CUELLO. CON UNA ESPONJA, O CON LA PUNTA DE LOS DEDOS, DIFUMINAREMOS EL CORRECTOR PERFECTAMENTE. SI DESEAS TAMBIÉN PUEDES USAR LO PARA AFINAR TUS LABIOS. 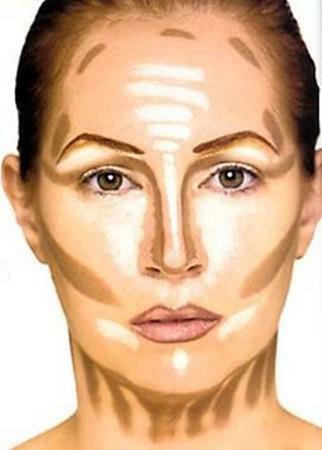 DESPUÉS DE DIFUMINAR EL CORRECTOR EN EL ROSTRO Y APLICAR LA BASE DE MAQUILLAJE, ILUMINAREMOS EL ROSTRO, EN LAS PARTES QUE MUESTRA LA FOTOGRAFÍA.